It looks like a photograph of some postcards carefully arranged on a table. This simple image is much more than that – it evokes a great deal of memories, connections and nostalgia stretching back many years. These colourful, exotic cards are the carefully preserved remains of a pastime that started in boyhood and had a huge influence on my life. I was a shortwave radio enthusiast, duelling with the ebb and flow of the airwaves to hear broadcasts from around the world. 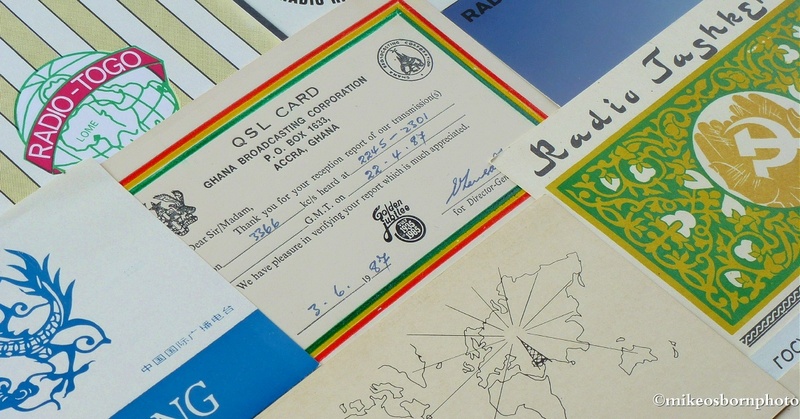 When I heard these stations, I told them how good their signals were and was sent a verification card as a reward, known in radio circles as a QSL. Cards from Uzbekistan, Ghana and the United Arab Emirates are among those in the photo. My passion grew over the years and flourished into travel abroad, work, meeting people from other countries and making some friends for life. But the unreliable radio waves eventually lost out to the internet and faded into obscurity. Just a simple capture like this means so much. It’s said that old photographs are full of memories, but it’s possible to create new pictures to evoke the same emotions. Are there any other shortwave enthusiasts out there? And has anyone taken a new photo to reconnect with the past? Great to discover there is a shortwave radio blog out there, from Indy DXer. It brings back a lot of good memories.